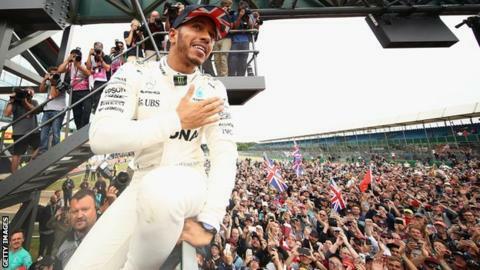 The British Grand Prix was such a perfect weekend for Lewis Hamilton that it was as if he had written his own script. Needing a good result to close the worryingly large championship gap to Ferrari's Sebastian Vettel, Hamilton's victory and the German's seventh place meant a 19-point swing in the Mercedes driver's favour. Criticised in some sections of the media for the way he had prepared - being the only driver to snub a high-profile event in London - Hamilton dominated the entire weekend, taking pole by more than half a second and driving away into a race of his own. Keen to expand his ever-growing statistical achievements, he took his 67th pole position - only one short of Michael Schumacher's all-time record - and equalled legends Jim Clark and Alain Prost's tally of five British Grand Prix victories. But the underlying message of the weekend might be even better for Hamilton than that. The reduction in his points deficit may have come about because of a degree of fortune, but it reflects what appears to be a growing trend in performance towards Mercedes as one of the closest seasons in years reached its halfway point. After the race, Hamilton was asked why he was so strong at Silverstone. "Because I own it," he replied, before breaking out into laughter. He was joking, but you know what they say about words said in jest. Certainly at no point during the three days of track action at Silverstone did it look as if Hamilton was in any danger of losing this race. Team-mate Valtteri Bottas was fastest in both Friday practice sessions, but in both cases there were extenuating circumstances and the underlying performance suggested Hamilton was on top. On Saturday he proved it, with a spectacular qualifying lap, more than half a second clear of anyone else and three-quarters of a second quicker than the Finn. The fastest Ferrari - of Kimi Raikkonen - was 0.547secs adrift, despite an engine upgrade for this weekend. And in the race, Hamilton was in a league of his own. He measured his pace in the first 15 laps or so but then he put the hammer down, pulling away from Ferrari's Kimi Raikkonen at a second a lap. That advantage was clearly there when he needed it, or chose to use it - and his fastest lap was 0.9secs quicker than Raikkonen's, both set in the closing stages of the race. Bottas' pace in the race, with a strong driver from ninth on the grid to finish second, underlined Mercedes' superiority around the fast sweeps of this classic track. It was almost certainly Mercedes' most dominant performance of the year, but it reflects a wider development over the last few races. Hamilton had lost ground to Vettel over the preceding two races and came to his home race 20 points behind the German. But those results came against the run of play. Had it not been for a loose head rest in Baku, Hamilton would have won three of the last four races. Who knows, had a gearbox problem not led to a grid penalty and a disrupted weekend in Austria a week before Silverstone, he might have taken pole and won there, too. The turning point was Monaco at the end of May, where Mercedes had their second bad weekend in three. A lot of work went in after that to find set-ups that were more effective at creating an even balance, and therefore working the tyres in an optimum way. Vettel reminded everyone after the race of the immense progress Ferrari had made after a winless 2016, but he admitted he sees signs for concern. "This year we have been, for the majority of the year, a match," the four-time champion said. "It has been probably true that in the last couple of races, Mercedes have been stronger but the real game changer is qualifying. "They are able to turn up the engine. They are gaining 0.6secs on the straights. Baku it was 0.7secs, Austria it was 0.5secs. We need to be fair with that. That is something we can't do. We are working on it but it doesn't happen overnight. "If you have the cars in front for the first lap, the race looks different. The car has been fantastic. There is no reason to panic or to worry. But for sure we need to be aware. There are a couple of advantages we need to work on and then it could be a different picture." Vettel pointed out that Ferrari were "10km/h faster through Copse [corner] than Mercedes" in qualifying but admitted: "That's one corner. There are a lot of other corners. I think we are on the right track. Our car is good, our car is strong, especially on Sunday. We need to make sure we step it up on Saturday and then Sundays look different." Vettel is right to pin-point qualifying, as a dig into the raw numbers reveals. In the first four races of the season, Mercedes had an average one-lap performance advantage over Ferrari of 0.141 seconds. Now, that number is 0.296secs. And taking the four races since Monaco on their own, it is a whopping 0.530secs. If that trend continues at a twisty Hungary in two weeks' time, Ferrari have a problem. Inevitably, attention was focused on Hamilton throughout the Silverstone weekend and not always in a good way. His decision not to attend last Wednesday's F1 promotional event in London drew a lot of criticism in the newspapers, and there was the usual Hamilton-focused feeding frenzy of media speculation over any British GP weekend. The drip-drip of what Mercedes perceived as negativity began to get on senior figures' nerves and one story claiming Hamilton was interested in a move to Ferrari particularly annoyed the team. Mercedes F1 boss Toto Wolff said that questioning the way Hamilton chose to prepare for a race weekend was "an insult" given his record, and said he was always comfortable with his lead driver missing the London event, even though they had "flagged the risks". As for Hamilton's future? Well, he was not exactly clear on his plans immediately after the race. Initially, he said: "I'm still enjoying it and I still have a contract with the team for at least a year so I plan to see that out at the moment." A couple of hours later, he said: "Contract and stuff… well, I can't really say what's going to happen six months from now but all I do know is I am loving racing and I really do feel I am driving better than I have ever driven. "I know that right now I am at my best and I want to stay there. "In life, you don't know what's going to happen. Right now, I love driving. You could say - its very unlikely, because I think I am always going to like driving and doing crazy stuff - but I'm just saying you don't know what frame of mind I will be in come Christmas time. "But hopefully it's a really good one with a fourth title. And even in getting another championship, it would never be a case of: 'Oh no, it's time to hang up my gloves.' I will always want to win more, even when I do stop something inside me will say I still want to win more. "But let's just focus at the moment on trying to get that fourth." This is typical Hamilton - he often contradicts himself, sometimes even within the same answer. And if you can decode what that all means, you are a smarter person than this writer. The facts are that Hamilton has a contract with Mercedes until the end of 2018, and that he and Mercedes have agreed to wait until the four-week summer break after the next race in Hungary to discuss the future - not that with 18 months remaining on his contract, there is any particular rush. The impression from those around Hamilton is that he is unlikely to leave Mercedes in the foreseeable future. He is happy in the team, the relationship with Wolff is strong after some frank and open discussions over the winter, and why would he want to leave? Yes, there is the whole Ferrari legend thing, but Hamilton is very focused on his personal career statistics. He is two poles away from eclipsing Michael Schumacher's record of 68. He is inching towards the German's win record, too, even if at 91 - with Hamilton on 57 - beating it is a tall order. The bottom line is that Hamilton wants performance, and the best place to get that at the moment remains Mercedes. The irony of the focus on Hamilton - inevitable as it might have been - is that the key to the driver market this summer is actually Vettel. He is the one out of contract at the end of the year - along with his team-mate Kimi Raikkonen and Bottas. Vettel is highly likely to stay at Ferrari. And if he stays there, as one insider put it, "would Lewis go there, and would they fork out $80m?" The same point, of course, applies to the likelihood of Vettel going to Mercedes. The only chance of that - or indeed of Fernando Alonso finding a place at one of the two top teams - is if Hamilton retires at the end of the year. In all likelihood, nothing will probably change much in the driver market this year, at least in the top teams, especially with Red Bull insisting both their drivers are tied down for at least another season and will definitely stay. It is the availability of Daniel Ricciardo at the end of 2018 and Max Verstappen either then or at the end of 2019 (depending on some get-out clauses that exist in the Dutchman's contract) that is making Wolff pause over re-signing Bottas. "It is almost a no-brainer," Wolff said. "I would just like to put the puzzle together and it is not only about 2018. It is about looking forward in 2019 and '20. There are some opportunities. That's why after Budapest I am going to contemplate on a beach about what's right and wrong for the team." The wildcard in the driver market is Robert Kubica, who had a second test for Renault last week as he seeks to mount a comeback more than six years after the rally accident that left him gravely injured and with only partial movement in his right arm. Sources close to Kubica say he is "ready to return at his old level" and that the test went exceptionally well - including proving his ability to turn the car around even the tightest hairpins. Renault now face a quandary. Do they wait until the Abu Dhabi test at the end of the season to verify his ability to drive a 2017 car - something about which Kubica himself is said to be in no doubt? Or do it in Hungary at the test immediately after the next race? That decision has not yet been made, it seems. On it, rests a feel-good human interest story of immense proportions - and the potential return to F1 of one of the most talented drivers of his generation in the most remarkable of circumstances. Why is F1 having such a good season?